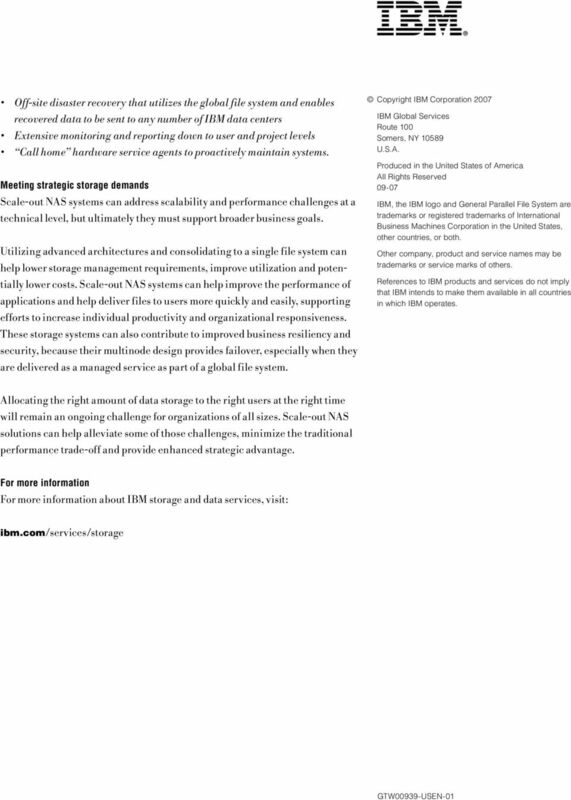 IBM Global Technology Services September NAS systems scale out to meet growing storage demand. Download "IBM Global Technology Services September 2007. NAS systems scale out to meet growing storage demand." 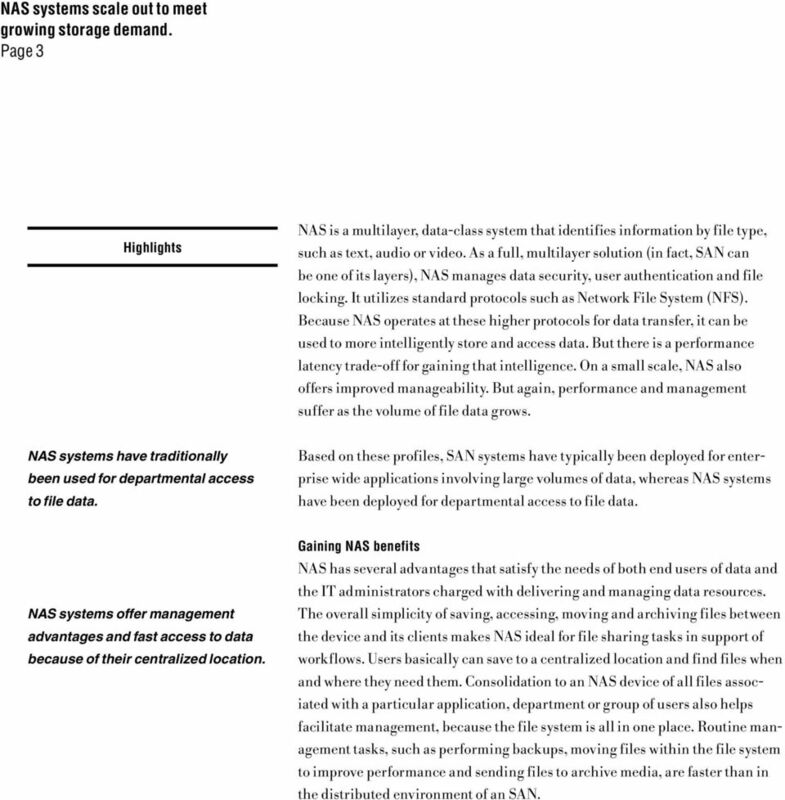 2 Page 2 Contents 2 Introduction 2 Understanding the traditional NAS role 3 Gaining NAS benefits 4 NAS shortcomings in enterprise settings 5 Scale-out NAS 8 Applications suited to scale-out NAS systems 10 A logical progression scale-out NAS as a service 12 Meeting strategic storage demands Introduction The efficient management of data is an ongoing struggle between access and scalability. Providing access to file-level data the files associated with individual documents, multimedia files, database and other applications becomes more difficult as more users are provided access and more data is stored. Achieving the scalability needed to respond to data volume growth also typically results in higher hardware and software costs, and greater management challenges. Network attached storage (NAS) solutions provide simplicity, manageability and access. But until now they ve lacked a single capability that has kept them from serving a role beyond the departmental level: scalability. Emerging NAS systems, and managed storage services that are powered by these technologies, offer compelling business value to organizations because of their broad spectrum of applicability, competitive price/performance and scalability to meet growing and evolving data demands. Understanding the traditional NAS role The two approaches to shared data storage, storage area networks (SANs) and NAS have much in common, but they function at two different protocol layers. SANs communicate with applications using lower-level protocols, which offer fast performance, but little in the way of intelligent manageability. A SAN is a storage-class system that identifies data by block number and utilizes Fibre Channel protocol or InfiniBand technology to access the raw data blocks. 3 Page 3 NAS is a multilayer, data-class system that identifies information by file type, such as text, audio or video. As a full, multilayer solution (in fact, SAN can be one of its layers), NAS manages data security, user authentication and file locking. It utilizes standard protocols such as Network File System (NFS). Because NAS operates at these higher protocols for data transfer, it can be used to more intelligently store and access data. But there is a performance latency trade-off for gaining that intelligence. 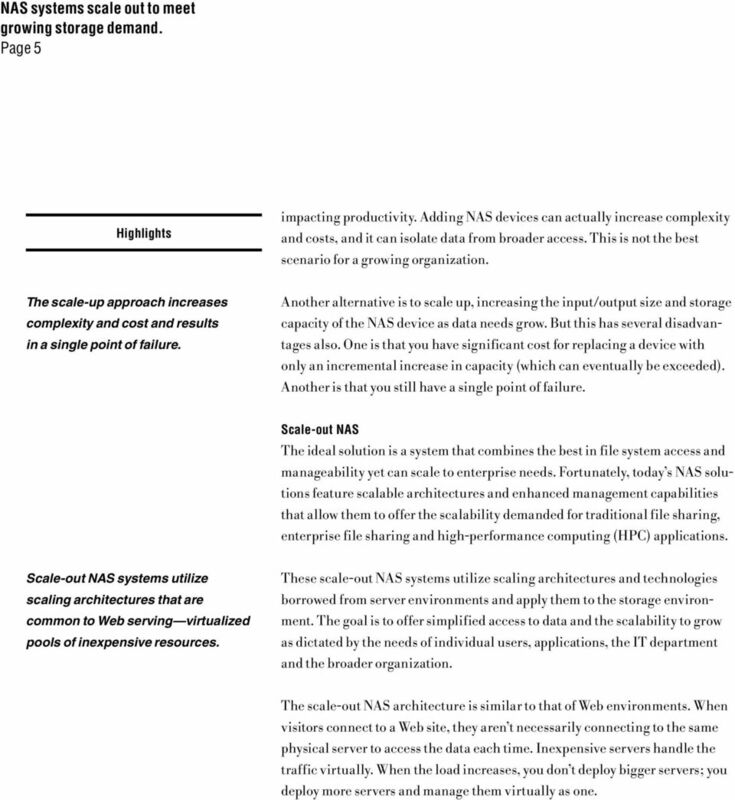 On a small scale, NAS also offers improved manageability. But again, performance and management suffer as the volume of file data grows. NAS systems have traditionally been used for departmental access to file data. Based on these profiles, SAN systems have typically been deployed for enterprise wide applications involving large volumes of data, whereas NAS systems have been deployed for departmental access to file data. NAS systems offer management advantages and fast access to data because of their centralized location. Gaining NAS benefits NAS has several advantages that satisfy the needs of both end users of data and the IT administrators charged with delivering and managing data resources. The overall simplicity of saving, accessing, moving and archiving files between the device and its clients makes NAS ideal for file sharing tasks in support of workflows. Users basically can save to a centralized location and find files when and where they need them. Consolidation to an NAS device of all files associated with a particular application, department or group of users also helps facilitate management, because the file system is all in one place. Routine management tasks, such as performing backups, moving files within the file system to improve performance and sending files to archive media, are faster than in the distributed environment of an SAN. 5 Page 5 impacting productivity. Adding NAS devices can actually increase complexity and costs, and it can isolate data from broader access. This is not the best scenario for a growing organization. The scale-up approach increases complexity and cost and results in a single point of failure. Another alternative is to scale up, increasing the input/output size and storage capacity of the NAS device as data needs grow. But this has several disadvantages also. One is that you have significant cost for replacing a device with only an incremental increase in capacity (which can eventually be exceeded). Another is that you still have a single point of failure. Scale-out NAS The ideal solution is a system that combines the best in file system access and manageability yet can scale to enterprise needs. Fortunately, today s NAS solutions feature scalable architectures and enhanced management capabilities that allow them to offer the scalability demanded for traditional file sharing, enterprise file sharing and high-performance computing (HPC) applications. Scale-out NAS systems utilize scaling architectures that are common to Web serving virtualized pools of inexpensive resources. These scale-out NAS systems utilize scaling architectures and technologies borrowed from server environments and apply them to the storage environment. The goal is to offer simplified access to data and the scalability to grow as dictated by the needs of individual users, applications, the IT department and the broader organization. The scale-out NAS architecture is similar to that of Web environments. When visitors connect to a Web site, they aren t necessarily connecting to the same physical server to access the data each time. Inexpensive servers handle the traffic virtually. When the load increases, you don t deploy bigger servers; you deploy more servers and manage them virtually as one. 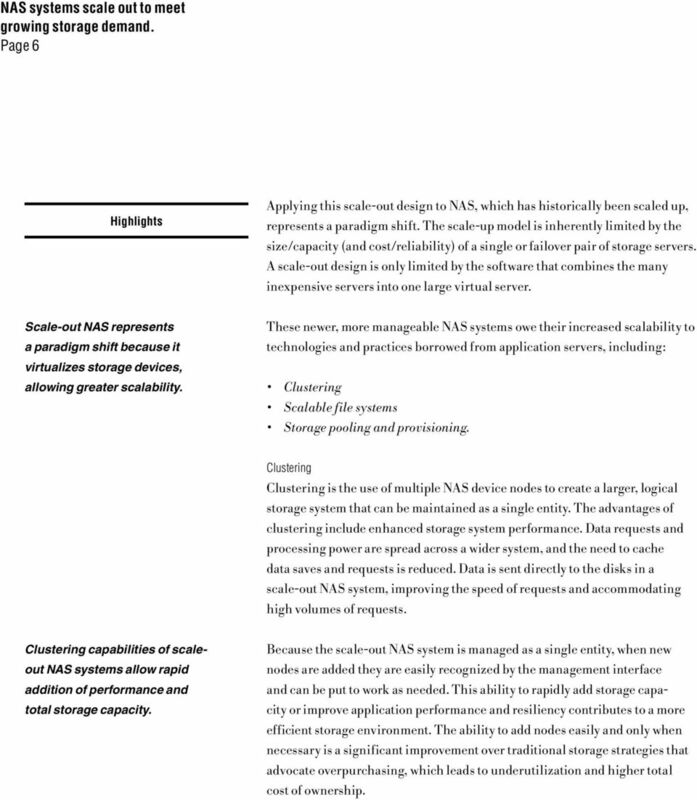 6 Page 6 Applying this scale-out design to NAS, which has historically been scaled up, represents a paradigm shift. The scale-up model is inherently limited by the size/capacity (and cost/reliability) of a single or failover pair of storage servers. A scale-out design is only limited by the software that combines the many inexpensive servers into one large virtual server. Scale-out NAS represents a paradigm shift because it virtualizes storage devices, allowing greater scalability. These newer, more manageable NAS systems owe their increased scalability to technologies and practices borrowed from application servers, including: Clustering Scalable file systems Storage pooling and provisioning. Clustering Clustering is the use of multiple NAS device nodes to create a larger, logical storage system that can be maintained as a single entity. The advantages of clustering include enhanced storage system performance. Data requests and processing power are spread across a wider system, and the need to cache data saves and requests is reduced. Data is sent directly to the disks in a scale-out NAS system, improving the speed of requests and accommodating high volumes of requests. Clustering capabilities of scaleout NAS systems allow rapid addition of performance and total storage capacity. Because the scale-out NAS system is managed as a single entity, when new nodes are added they are easily recognized by the management interface and can be put to work as needed. This ability to rapidly add storage capacity or improve application performance and resiliency contributes to a more efficient storage environment. The ability to add nodes easily and only when necessary is a significant improvement over traditional storage strategies that advocate overpurchasing, which leads to underutilization and higher total cost of ownership. 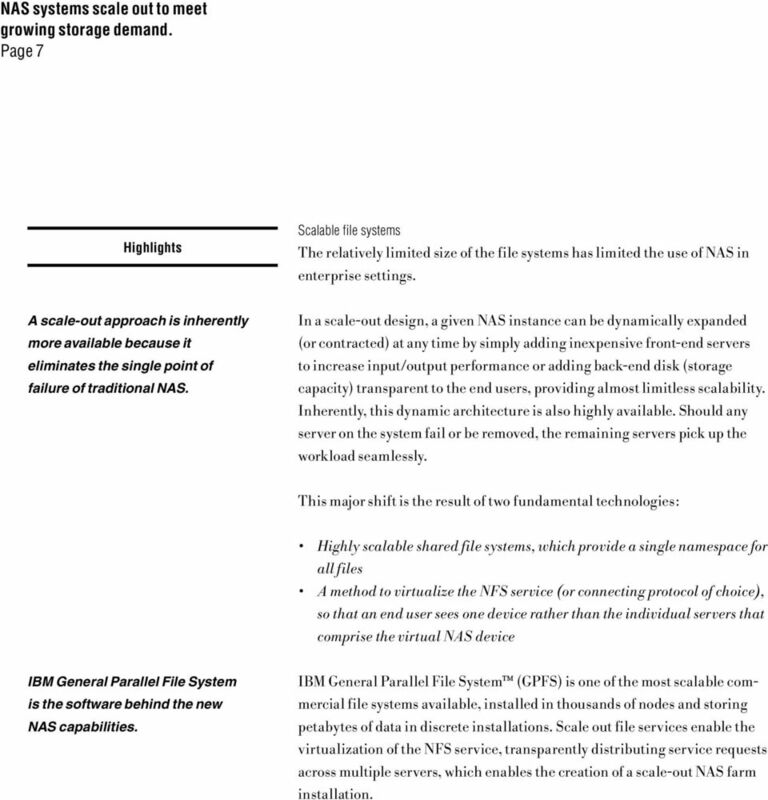 7 Page 7 Scalable file systems The relatively limited size of the file systems has limited the use of NAS in enterprise settings. A scale-out approach is inherently more available because it eliminates the single point of failure of traditional NAS. In a scale-out design, a given NAS instance can be dynamically expanded (or contracted) at any time by simply adding inexpensive front-end servers to increase input/output performance or adding back-end disk (storage capacity) transparent to the end users, providing almost limitless scalability. Inherently, this dynamic architecture is also highly available. Should any server on the system fail or be removed, the remaining servers pick up the workload seamlessly. 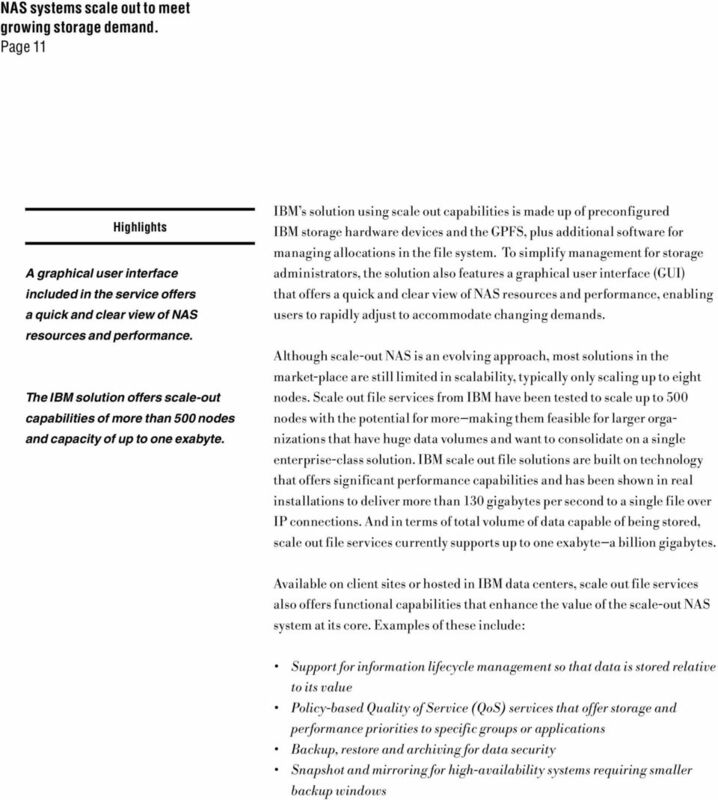 This major shift is the result of two fundamental technologies: Highly scalable shared file systems, which provide a single namespace for all files A method to virtualize the NFS service (or connecting protocol of choice), so that an end user sees one device rather than the individual servers that comprise the virtual NAS device IBM General Parallel File System is the software behind the new NAS capabilities. IBM General Parallel File System (GPFS) is one of the most scalable commercial file systems available, installed in thousands of nodes and storing petabytes of data in discrete installations. Scale out file services enable the virtualization of the NFS service, transparently distributing service requests across multiple servers, which enables the creation of a scale-out NAS farm installation. 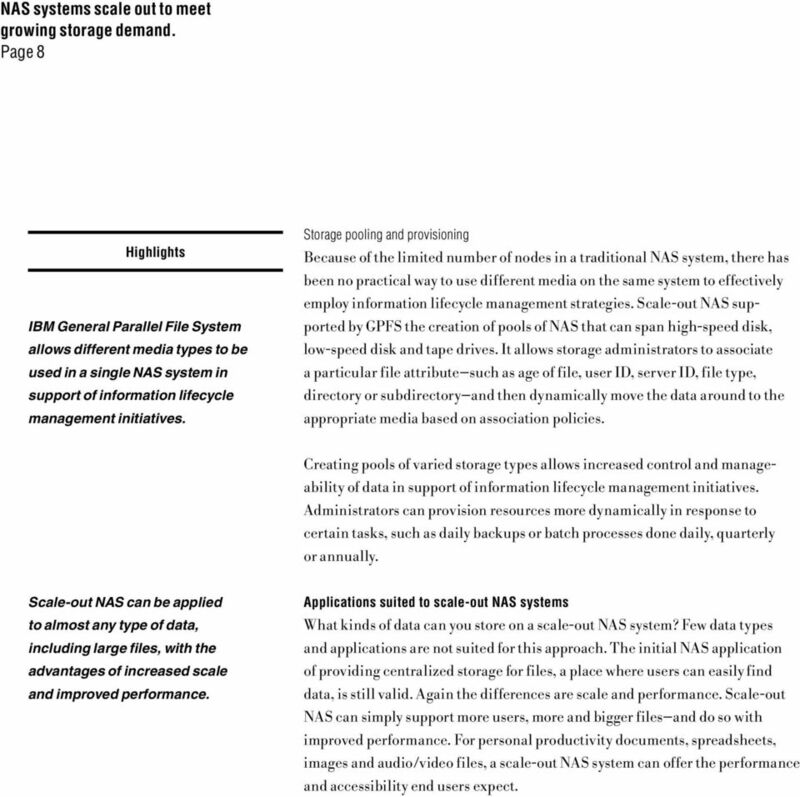 8 Page 8 IBM General Parallel File System allows different media types to be used in a single NAS system in support of information lifecycle management initiatives. Storage pooling and provisioning Because of the limited number of nodes in a traditional NAS system, there has been no practical way to use different media on the same system to effectively employ information lifecycle management strategies. Scale-out NAS supported by GPFS the creation of pools of NAS that can span high-speed disk, low-speed disk and tape drives. It allows storage administrators to associate a particular file attribute such as age of file, user ID, server ID, file type, directory or subdirectory and then dynamically move the data around to the appropriate media based on association policies. Creating pools of varied storage types allows increased control and manageability of data in support of information lifecycle management initiatives. Administrators can provision resources more dynamically in response to certain tasks, such as daily backups or batch processes done daily, quarterly or annually. Scale-out NAS can be applied to almost any type of data, including large files, with the advantages of increased scale and improved performance. Applications suited to scale-out NAS systems What kinds of data can you store on a scale-out NAS system? Few data types and applications are not suited for this approach. The initial NAS application of providing centralized storage for files, a place where users can easily find data, is still valid. Again the differences are scale and performance. Scale-out NAS can simply support more users, more and bigger files and do so with improved performance. For personal productivity documents, spreadsheets, images and audio/video files, a scale-out NAS system can offer the performance and accessibility end users expect. 10 Page 10 Implementing a scale-out NAS system requires expertise. A logical progression scale-out NAS as a service Fully realizing the strategic advantages and technical capabilities of scale-out NAS requires considerable expertise. Correctly designing and implementing a scale-out NAS system requires understanding and practical experience with high-end server environments and multiple operating system platforms, as well as storage design and management expertise that few organizations, even global enterprises, have access to today. 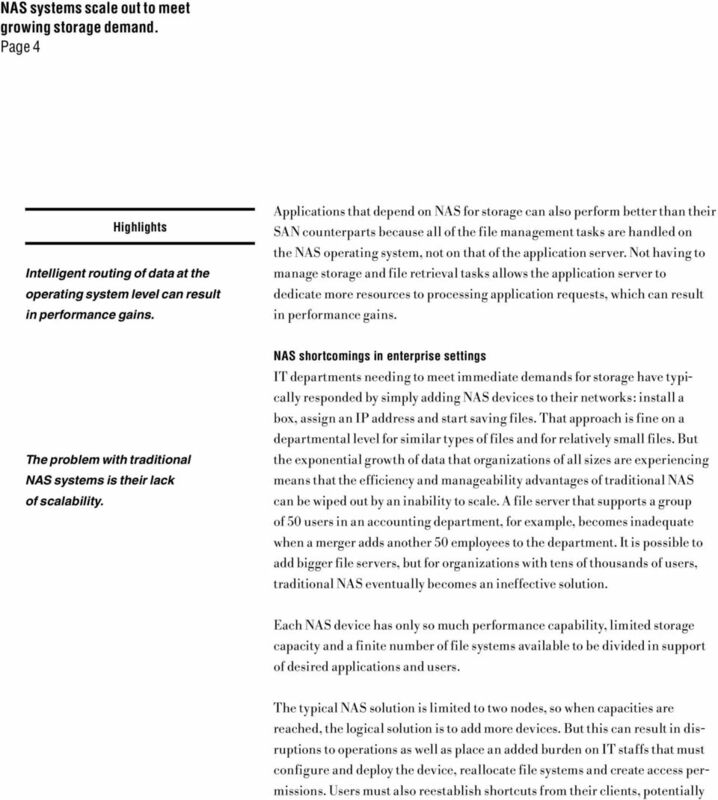 And although a scale-out NAS system, once implemented, makes management of the storage environment more dynamic, it will require ongoing management expertise to maintain performance. If and when nodes need to be added to a scale-out NAS implementation, that will also require careful planning and execution to reduce the risk of impact on production environments. A service approach can help organizations get up and running quickly. 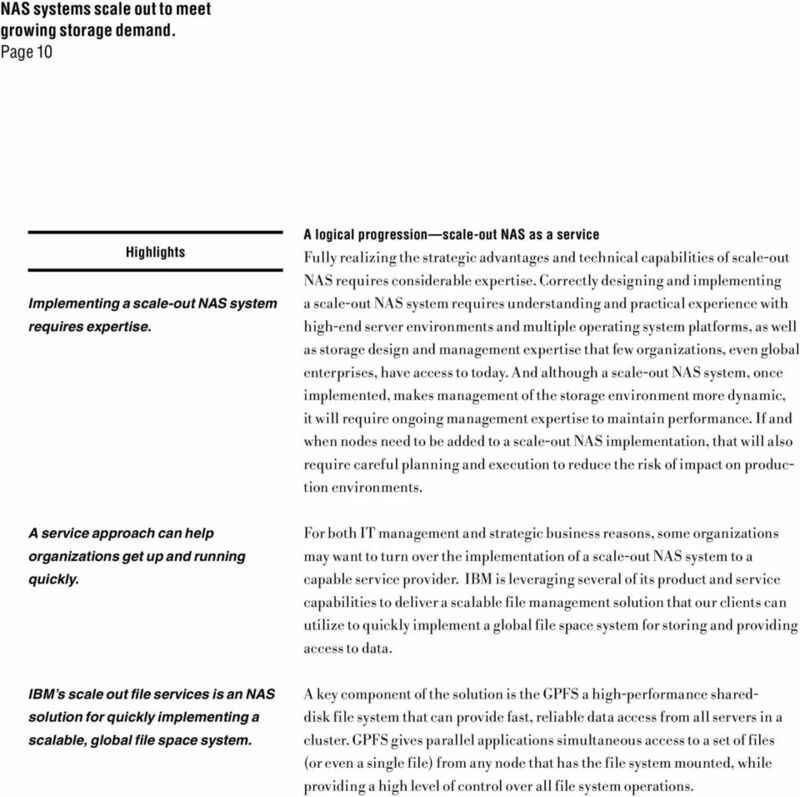 For both IT management and strategic business reasons, some organizations may want to turn over the implementation of a scale-out NAS system to a capable service provider. IBM is leveraging several of its product and service capabilities to deliver a scalable file management solution that our clients can utilize to quickly implement a global file space system for storing and providing access to data. IBM s scale out file services is an NAS solution for quickly implementing a scalable, global file space system. A key component of the solution is the GPFS a high-performance shareddisk file system that can provide fast, reliable data access from all servers in a cluster. GPFS gives parallel applications simultaneous access to a set of files (or even a single file) from any node that has the file system mounted, while providing a high level of control over all file system operations. IBM Global Technology Services March 2008. Virtualization for disaster recovery: areas of focus and consideration. What Is Microsoft Private Cloud Fast Track? THE EMC ISILON STORY. Big Data In The Enterprise. Copyright 2012 EMC Corporation. All rights reserved.